This week, the City of Toronto is celebrating its 8th annual Feeding Toronto's Hungry Students Week (October 1-5, 2012). To mark this special week, Toronto's top chefs are asking parents to try their personal, childhood-inspired school lunch recipes at home, and to also consider making a donation to The Angel Foundation for Learning, a 25-year-old registered Canadian charity that’s dedicated to supporting the Toronto Catholic District School Board's most vulnerable students. 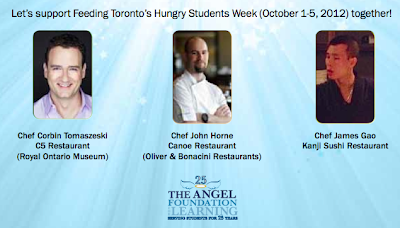 These recipes have been donated by Chef Corbin Tomaszeski from the ROM's C5, Chef John Horne from Oliver & Bonacini's Canoe (see recipe below), and Chef James Gao from Kanji, in the hopes of raising awareness and funds to fight student hunger. Place all ingredients in a small container with a lid. Give it a quick stir and place the lid on and shake it up. Allow it to marinate. Combine all dry ingredients in a bowl. Cut cold butter into the dry ingredients and mix with a fork or pastry cutter. Add in buttermilk. Allow to sit for 5 to 10 minutes in the fridge. Roll out to 3⁄4 inch thickness and use a large cookie cutter to cut rounds out of the dough. Place on a baking sheet and bake at 325 ̊F for 15 to 18 minutes. 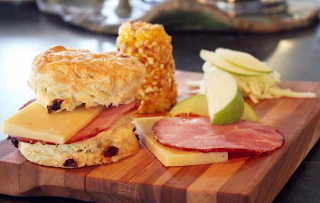 Once cooled, cut open and layer with your favourite country ham and cheese. Boil corn on the cob and cool in refrigerator. Once chilled, brush corn with your desired spread. For more recipes, visit angelfoundationforlearning.org and while your there, please donate if you have five dollars to spare. Just $5 can feed a hungry child breakfast for a week.